Dr. Michael Duong is a progressive orthodontist dedicated to providing the highest quality of treatment and personalized care in a modern state of the art office that is conveniently located in the heart of downtown Ridgewood, New Jersey. Dr. Duong and the Precision Orthodontics family want our patients to have beautiful, healthy smiles, but we also want our patients to feel safe, confident, and special each time they come to our practice. It is our job to make sure our patients get the most out of their orthodontic treatment and leave smiling! Precision Orthodontics offers treatment for children and adults. We utilize the latest in modern technology to facilitate treatment - to make treatment time shorter and more comfortable. We have different treatment options to fit everyone's needs including Invisalign®, Insignia™, Damon® System, Clear Ceramic braces, and retainers. Our brand new office is equipped with the most advanced technology to provide the highest quality of care. Our knowledgeable staff is committed to being service oriented in a patient-focused environment. Our office is handicapped accessible with parking in the rear. 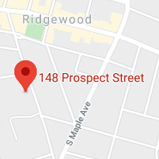 Our office is conveniently located in the heart of downtown Ridgewood, New Jersey. Serving Ridgewood, Glen Rock, Midland Park, Ho Ho Kus, Waldwick, Wyckoff, Paramus, Saddle River, Allendale, Upper Saddle River, Ramsey, Mahwah, Franklin Lakes, Fair Lawn, Hawthorne and the surrounding Bergen County area. Contact our office to schedule your complimentary orthodontic consultation. We look forward to helping you achieve a beautiful smile you can be proud to show off!